Low-dose ritonavir (RTV) boosts plasma amprenavir (APV) exposure. Little has been published on the efficacy, tolerability, and safety of APV 600 mg/RTV 100 mg (APV600/RTV) twice daily (BID) compared to APV 1200 mg BID (APV1200). ESS40011 was a 24-week, multicenter, open-label, clinical trial in which antiretroviral therapy-naïve and -experienced HIV-1-infected adults were randomized 3:1 to receive either APV600/RTV BID or APV1200 BID, in combination with ≥ 2 non-protease inhibitor antiretroviral drugs. 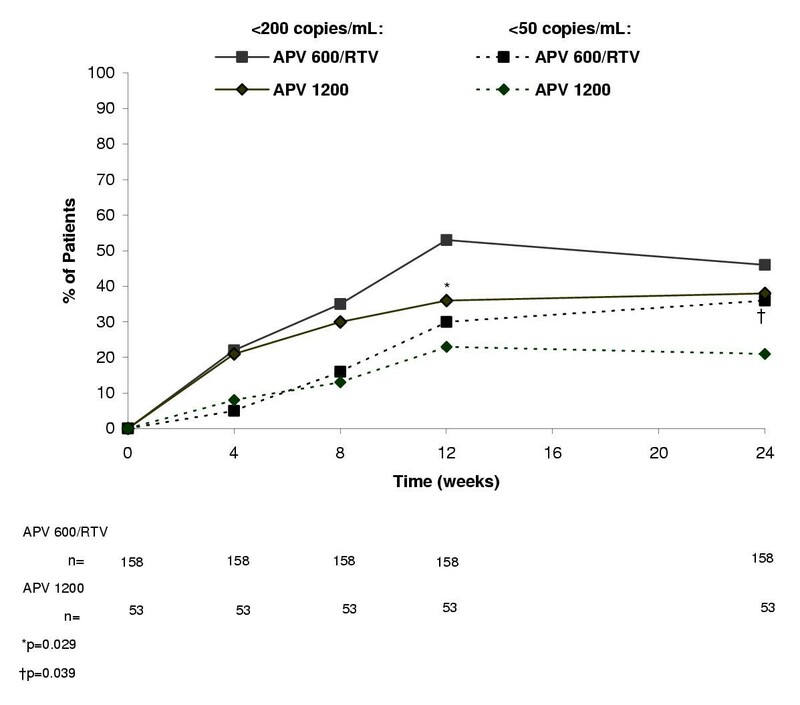 Non-inferiority of the APV600/RTV regimen to the APV1200 regimen was established if the 95% lower confidence limit for the difference in proportion of patients achieving HIV-1 RNA <200 copies/mL at week 24 with APV 600/RTV minus APV1200 was ≥-0.12. Late in the conduct of the trial, patients not yet completing 24 weeks of therapy were given the option of continuing treatment for an additional 24-week period. 211 patients were randomized, 158 to APV600/RTV and 53 to APV1200. At week 24, APV600/RTV was similar to or better than APV1200 (HIV-1 RNA <200 copies/mL in 62% [73/118] vs 53% [20/38] of patients; intent-to-treat: observed analysis). In the APV600/RTV arm, significantly more patients achieved HIV-1 RNA <50 copies/mL (48% [57/118] vs 29% [11/38] with APV1200, P = 0.04), and greater mean reduction from baseline in HIV-1 RNA was observed (-2.21 vs -1.59 log10 copies/mL, P = 0.028). The two treatment arms were similar with respect to mean overall change from baseline in CD4+ count, frequency of drug-related grade 1–4 adverse events, and frequency of discontinuing treatment due to adverse events (most commonly nausea, diarrhea, vomiting or fatigue; 7% vs 8%), although a lower proportion of patients in the APV600/RTV arm experienced drug-related oral/perioral paresthesia (2% vs 8%). Eleven (73%) of 15 patients who had HIV-1 RNA <200 copies/mL at week 24 and chose to continue study treatment maintained this level of virologic suppression at follow-up 24 weeks later. APV600 RTV BID was similar to or better than APV1200 BID in virologic response. Virologic results in a small number of patients who continued treatment for 24 weeks post-study suggest that virologic suppression with APV600 RTV BID is durable. Amprenavir (APV) is a potent protease inhibitor (PI) that is used in combination with other antiretroviral drugs for the treatment of antiretroviral-naïve and -experienced adults and children with HIV infection [1–5]. APV offers the convenience of twice-daily (BID) administration with no food or fluid restrictions [6, 7]. Preclinical and clinical data suggest that APV has a lower potential to cause lipodystrophy and metabolic abnormalities than other currently available PIs [8–10]. APV has a distinct resistance profile that permits it to be considered as a treatment option for either PI-naïve or PI-experienced patients . In a 64-week trial in treatment-naïve patients (NZTA4002; n = 302), APV 1200 mg, administered BID (APV1200) with one abacavir 300 mg tablet and one lamivudine 150 mg/zidovudine 300 mg combination tablet (Combivir®), was as effective as nelfinavir 750 mg three times daily plus Combivir BID, with regard to the proportion of patients achieving HIV-1 RNA <40 copies/mL at week 64: 77% vs 66% (as-treated analysis) . However, many patients in this trial withdrew prematurely because of adverse events that may have been, in part, related to the high pill burden (16 large 150 mg soft-gelatin capsules daily) associated with APV dosing and excipients contained in the APV formulation available at the time of the trial. To reduce APV pill burden and possibly improve tolerability of APV treatment, pharmacokinetic research efforts have been directed at combining APV with the PI ritonavir (RTV), which inhibits CYP3A4-mediated hepatic metabolism of APV, thereby enhancing plasma APV exposure [13–15]. The administration of RTV at the clinically sub-therapeutic dosage of 100 mg BID was found to boost APV plasma exposure to such a degree as to permit halving the APV daily pill burden from 16 to 8 capsules/day, in addition to maintaining the minimum plasma APV concentration (Cmin) over 24 hours well above the 50% inhibitory concentrations (IC50) of patient-derived HIV-1 isolates . A pharmacokinetic study in 20 HIV-infected patients, PROF1004, showed that APV at the lower dosage of 600 mg BID combined with RTV 100 mg BID (APV600/RTV) resulted in a geometric mean steady-state APV Cmin (1.92 μg/mL) over 6-fold higher than the Cmin resulting from APV1200 (0.3 μg/mL) . This Cmin was more than 13-fold higher than the IC50 of APV against HIV of antiretroviral-naïve patients (mean, 0.146 ± 0.125 μg/mL) and over 2-fold higher than the IC50 of APV against HIV of multi-PI-resistant patients (mean, 0.903 ± 0.846 μg/mL) (IC50s adjusted for the 90% protein binding observed with APV). Following APV600/RTV, the APV maximum serum concentration (Cmax) has been reported to be slightly lower (by 27%) than that observed with APV1200 , which may account for the RTV-boosted APV regimen being less likely to cause certain adverse events (e.g., oral/perioral paresthesia and headache) . Since the above pharmacokinetic studies and others involving pharmacokinetic modeling predictions were conducted over only a short period (generally ≤ 14 days) and in a small number of patients, there remained a need to evaluate low-dose APV/RTV combinations in large populations of HIV-1-infected patients over a therapeutically relevant period. The purpose of ESS40011 was to compare the efficacy, safety, and tolerability of APV 600 mg BID plus RTV 100 mg BID (APV600/RTV) to APV 1200 mg BID (APV1200) over 24 weeks in antiretroviral-naïve or -experienced HIV-infected patients who were receiving other background antiretroviral drugs. Late in the study, patients who had not yet completed 24 weeks of treatment were given the option to continue treatment in a subsequent 24-week extension phase to assess the durability of virologic response. Male and non-pregnant, non-lactating female outpatients were eligible for study enrollment if they were at least 18 years of age; had HIV-1 infection documented by HIV-1 antibody enzyme-linked immunosorbent assay (ELISA) and confirmed by Western blot test, positive HIV-1 culture, positive HIV-1 serum antigen, or plasma viremia; and CD4+ cell counts ≥ 50/mm3. Women of childbearing potential had to have a negative serum β-human chorionic gonadotropin (HCG) pregnancy test at screening, and had to be willing to use an adequate method of contraception during the study. Patients could be either antiretroviral-naïve or -experienced. If patients were antiretroviral-experienced, they had to be naïve to APV, have a plasma HIV-1 RNA >1000 copies/mL, show susceptibility to APV and ≥ 2 other antiretroviral drugs, and remain on their most recent treatment regimen until completion of the screening visit. For all drugs, susceptibility was defined as an HIV isolate with <4.0-fold change in IC50 (determined by VIRCOGEN™ [Tibotec-Virco NV, Mechelen, Belgium], a virtual phenotype assay) in comparison to the control virus. Patients were excluded if they had active Centers for Disease Control (CDC) Class C status; could not comply with the study schedule; were in another investigational drug study; were undergoing opiate detoxification; had a malabsorption syndrome or pre-existing condition that interfered with normal gastrointestinal transit; had clinically significant laboratory abnormalities, required radiation therapy or cytotoxic chemotherapy, or had received immunomodulating agents, within 4 weeks pre-study; or had received an HIV-1 immunotherapeutic vaccine within 3 months pre-study. Patients were allowed to take pravastatin, fluvastatin, cerivastatin, or atorvastatin for hyperlipidemia at the cautionary discretion of the investigators, but were not allowed to take lovastatin, simvastatin, or any other drug known to significantly affect metabolism by the cytochrome P450 CYP3A4 enzyme system. In this multicenter, open-label clinical trial, patients were first stratified according to prior antiretroviral therapy exposure (i.e., naïve or experienced), then randomized 3:1 to treatment for 24 weeks with either APV 600 mg BID plus RTV 100 mg BID or to APV 1200 mg BID in combination with ≥ 2 non-PI antiretroviral drugs. APV was supplied as 150 mg soft-gelatin capsules of Agenerase® (GlaxoSmithKline, Research Triangle Park, North Carolina); thus, eight capsules were given for each 1200 mg dose of APV and four capsules for each 600 mg dose. RTV was supplied as 100 mg soft-gelatin capsules of Norvir® (Abbott Laboratories, North Chicago, Illinois). Late in the study, patients who had not yet completed 24 weeks of treatment were given the option to continue treatment in a subsequent 24-week extension phase to assess the durability of virologic response. During the 6-week period prior to the start of the study, candidates were screened for study eligibility, demography, CDC classification, HIV risk factors, mode of HIV transmission, antiretroviral therapy history, and medical history, and given a physical examination. Prior to study initiation, the ESS40011 study protocol was approved by the Institutional Review Boards at each participating study site. All participants provided written informed consent before any study-related procedures were commenced. The initial 24-week portion of the study was conducted between June 13, 2000 and October 18, 2001 at 44 treatment centers in the United States. The primary efficacy parameter was the proportion of patients with plasma HIV-1 RNA levels <200 copies/mL at week 24. Plasma HIV-1 RNA was assessed by the Roche Amplicor MONITOR Ultrasensitive assay (version 1.5; lower limit of quantitation [LLOQ] 50 copies/mL and quantitation range of 50 to 75,000 copies/mL, Roche Diagnostics, Branchburg, New Jersey). Patients were classified as having reached a virologic endpoint if, at week 24, plasma HIV-1 RNA levels were ≥ 200 copies/mL; or if the plasma HIV-1 RNA had not decreased by at least 0.5-log10 from baseline at week 8, with confirmation at week 12. Secondary efficacy measures included assessment of the proportion of patients achieving HIV-1 RNA <50 copies/mL (using the above mentioned assay); changes in CD4+ cell counts (measured by flow cytometry) compared with baseline values; and progression of HIV disease from baseline status to the occurrence of the first new event involving a change in CDC class for each patient. Patients who remained at their entry CDC class were considered to be clinical non-progressors. Change from baseline in plasma HIV-1 RNA levels was assessed at weeks 4, 8, 12, and 24 in all patients, as well as at weeks 32, 40 and 48 in patients who participated in the treatment extension phase. CD4+ cell counts were assessed at baseline, and at weeks 12 and 24. Patients had plasma collected for genotype/virtual phenotype at screening (for experienced patients only) and at the time of virologic failure (results to be reported elsewhere). The study was powered to evaluate whether the virologic efficacy (proportion of patients with plasma HIV-1 HIV <200 copies/mL at week 24) in the APV 600/RTV arm was at least as good (non-inferior) as in the APV1200 arm. Non-inferiority of the APV600/RTV regimen to the APV1200 regimen was established if the 95% lower confidence limit (LCL) for the difference in proportion of patients achieving HIV-1 RNA <200 copies/mL at week 24 with APV 600/RTV minus APV1200 was ≥-0.12. The non-inferiority margin of 0.12 was chosen based on previous regulatory studies and was pre-specified in the protocol. Target enrollment was 198 in the APV600/RTV arm and 66 in the APV1200 arm. The primary analysis was made in the intent-to-treat (ITT) population, which consisted of all eligible patients who were randomized into the study regardless of what treatment was actually received and the eventual outcome of study participation. Two types of analyses were performed: an ITT: observed analysis, in which only available assessments were used (no imputation for missing values), regardless of whether the patient was still receiving their original therapy; and an ITT: missing = failure (ITT: M = F) analysis, in which all missing values constituted failure. Comparisons between treatment arms regarding proportion of patients achieving HIV-1 RNA <200 copies/mL and <50 copies/mL were made using the Cochran-Mantel-Haenszel test controlling for prior antiretroviral drug experience. Changes from baseline in plasma HIV-1 RNA (log10 copies/mL) and CD4+ cell count, and average area under the curve minus baseline (AAUCMB) in plasma HIV-1 RNA, were tabulated by treatment arm and visit, then analyzed using analysis of variance (ANOVA). The safety population consisted of all patients who consumed at least 1 dose of study drug. Safety parameters included incidence of treatment-limiting toxicities (clinical and laboratory adverse events); and change from baseline in selected laboratory variables at weeks 4, 8, 12 and 24. Fisher's exact test was used to compare adverse event rate and ANOVA was used to compare change from baseline for laboratory variables between the two treatment arms. A P value of <0.05 was considered statistically significant. Statistical analyses were performed using SAS version 6.12 (SAS Institute, Inc., Cary, NC). A total of 211 patients enrolled; they were predominantly male (87%), ethnically diverse (48% Caucasian, 37% African American, 14% Hispanic), and had a mean age of 42 years, median baseline HIV-1 RNA level of 4.33 log10 copies/mL, and median baseline CD4+ cell count of 257 cells/mm3. Most of the study population was antiretroviral-experienced (81%). One hundred and fifty-eight (158) patients were randomized to the APV600/RTV regimen and 53 to the APV1200 regimen. The two treatment arms did not differ with respect to any baseline characteristic (Table 1). The most common background antiretroviral regimens taken by patients in the APV600/RTV and APV1200 treatment arms were stavudine/didanosine (25% vs 30%), Combivir (19% for both arms), abacavir/stavudine (11% for both arms), lamivudine/stavudine (9% vs 4%), and abacavir/didanosine (5% vs 6%). A total of 150 patients (71%) completed all 24 weeks of the study, including a similar proportion of patients in the APV600/RTV arm (72%) and APV1200 arm (68%). Reasons for premature withdrawal from treatment were also similar between the APV600/RTV and APV1200 arms, except for fewer patients in the APV600/RTV arm withdrawing due to protocol-defined virologic failure (1% vs 6%) (Table 1). Antihyperlipidemic agents were used by 1 patient in each treatment arm, neither of whom had taken this type of medication pre-study. No deaths or clinical progressions of HIV disease occurred. Twenty patients enrolled into the extension phase, including 15 in the APV600/RTV arm and 5 in the APV1200 arm. At week 24, the proportion of patients with HIV-1 RNA <200 copies/mL in the APV600/RTV arm and APV1200 arm was 46% (73/158) and 38% (20/53), respectively, in the ITT: M = F analysis (Figure 1) and 62% (73/118) and 53% (20/38), respectively, in the ITT: observed analysis (Figure 2). The APV600/RTV regimen proved to be similar to or better than the APV1200 regimen because the 95% LCL for the difference in proportions of patients achieving HIV-1 RNA <200 copies/mL with APV600/RTV minus APV1200 was ≥ -0.12 (-0.04 [ITT: M = F analysis] and -0.06 [ITT: observed analysis]). The proportion of antiretroviral-naïve patients who achieved HIV-1 RNA <200 copies/mL in the APV600/RTV arm was twice that for the APV1200 arm in the ITT: M = F analysis (63% [19/30] vs 30% [3/10], P = 0.141), and 26% higher in the ITT: observed analysis (76% [19/25] vs 50% [3/6], P = 0.320). In contrast, the proportions in antiretroviral-experienced patients were similar in the treatment arms in both analyses (ITT: M = F analysis: 42% [54/128] vs 40% [17/43], P = 0.859; ITT: observed analysis: 58% [54/93] vs 53% [17/32], P = 0.682). Percentage of patients with plasma HIV-1 RNA levels <200 copies/mL and <50 copies/mL in the intent-to-treat (ITT): missing = failure analysis. Percentage of patients with plasma HIV-1 RNA levels <200 copies/mL and <50 copies/mL in the ITT: observed analysis. Virologic findings using the more stringent virologic suppression endpoint of HIV-1 RNA <50 copies/mL paralleled those with the <200 copies/mL endpoint, although differences attained statistical significance. Thus, at week 24, significantly more patients in the APV600/RTV arm than the APV1200 arm achieved HIV-1 RNA <50 copies/mL (ITT: M = F analysis: 36% [57/158] vs 21% [11/53], P = 0.039; ITT: observed analysis: 48% [57/118] vs 29% [11/38], P = 0.042) (Figures 1 and 2, respectively). The proportion of antiretroviral-naïve patients who achieved HIV-1 RNA <50 copies/mL was 47% (14/30) in the APV600/RTV arm and 20% (2/10) in the APV1200 arm (P = 0.141), whereas the proportion of antiretroviral-experienced patients who achieved HIV-1 RNA <50 copies/mL was 34% (43/128) in the APV600/RTV arm and 21% (9/43) in the APV1200 arm (P = 0.119) (ITT:M = F analysis). 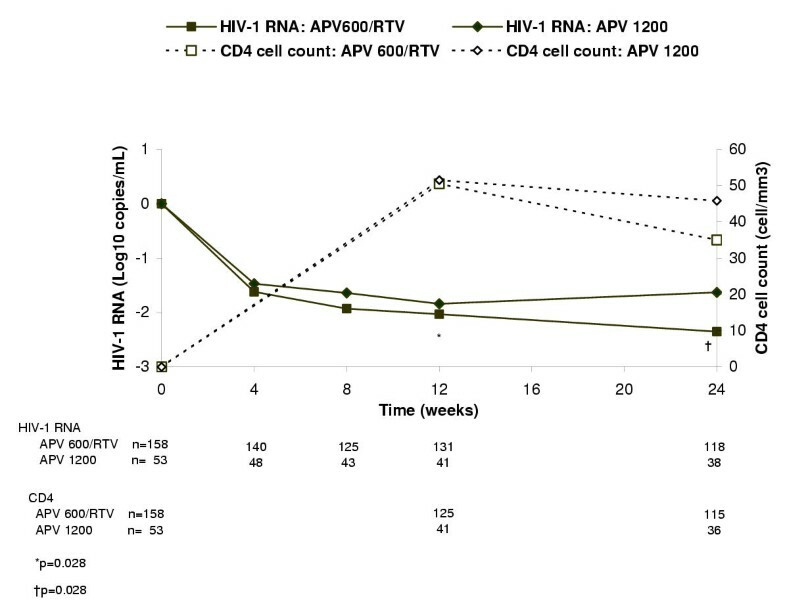 In the ITT: observed analysis, mean reduction in HIV-1 RNA from baseline was significantly greater at week 24 in the APV600/RTV arm than the APV1200 arm (-2.21 vs -1.59 log10 copies/mL, P = 0.028) (Figure 3), as was the mean AAUCMB in HIV-1 RNA in both the total population (-1.56 vs -1.25 log10 copies/mL, P = 0.045) and antiretroviral-naïve subgroup (-2.40 vs -1.60 log10 copies/mL, P = 0.020). No significant differences were observed between the APV600/RTV and APV1200 treatment arms with respect to mean AAUCMB in HIV-1 RNA for the antiretroviral-experienced subgroup (-1.40 vs -1.20 log10 copies/mL P = 0.209), or proportion of antiretroviral-naïve patients achieving HIV-1 RNA <50 copies/mL (56% vs 33%, P = 0.394) (ITT: observed analysis). Median change from baseline in plasma HIV-1 RNA levels and CD4+ cell counts in the ITT: observed analysis. Of the 20 patients (15 in the APV600/RTV arm and 5 in the APV1200 arm) enrolled into the extension phase, 15 (11 APV600/RTV, 4 APV1200) had HIV-1 RNA <200 copies/mL at week 24. Eleven (8 APV600/RTV, 3 APV1200) of these 15 patients continued to have HIV-1 RNA levels <200 copies/mL between week 24 and week 48, 3 rebounded, and 1 discontinued at week 32. Of the 5 patients who had HIV-1 RNA >200 copies/mL at week 24, 1 discontinued when an HIV-1 RNA of 186 copies/mL was measured at week 32, 1 missed week 32 and 40 visits (but had an HIV-1 RNA of 878 copies/mL at week 48), and 3 continued to have HIV-1 RNA >200 copies/mL from week 24 to week 48. In these 3 patients, HIV-1 RNA levels ranged from 316 to 3645 copies/mL, 1247 to 5175 copies/mL, and 143 to 12,149 copies/mL, respectively, between weeks 24 and 48. At baseline, the median CD4+ cell count in the APV600/RTV and APV1200 arms was 271 and 255 cells/mm3, respectively. Over the 24 weeks of the study, the median CD4+ cell count remained higher than baseline, with median elevations above baseline peaking at week 12 in both treatment arms (+51 and +52 cells/mm3, respectively) (Figure 3). At week 24, the median change from baseline in CD4+ cell count in the APV600/RTV and APV1200 arms was +35 and +46 cells/mm3, respectively, and the final median CD4+ cell count was 321 and 346 cells/mm3, respectively. In patients who participated in the 24-week extension phase, 12 of 15 patients in the APV600/RTV arm and 4 of 5 in the APV1200 arm had a median change from baseline in CD4+ cell count at week 48 of +156 cell/mm3, and +143 cell/mm3, respectively. The final median CD4+ cell count in these patients was 404 and 407 cells/mm3, respectively. The remaining patients did not have CD4+ data reported. Table 2 shows the drug-related adverse events that were reported in ≥ 5% of patients. Nausea, diarrhea, vomiting, and fatigue were the most common adverse events in both treatment arms. The incidence of drug-related oral/perioral paresthesia was lower in the APV600/RTV treatment arm than the APV1200 arm (2% vs 8%). No differences between the APV600/RTV and APV1200 treatment arms were observed regarding the frequency of drug-related grade 1–4 adverse events (44% vs 45%), frequency of discontinuing treatment due to adverse events (7% vs 8%), incidence of hyperglycemia (1 vs 0 patient), nonspecific lipodystrophy (1 vs 0), buffalo hump (1 vs 0), or hypercholesterolemia (1 vs 0). More cases of hypertriglyceridemia were reported as adverse events in the APV600/RTV arm (11 [7%] vs 0). However, review of laboratory changes revealed that the incidence of grade 3–4 hypertriglyceridemia was the same (4%) in each treatment arm. *Adverse events were classified as drug-related based on the investigators' assessment of causality. 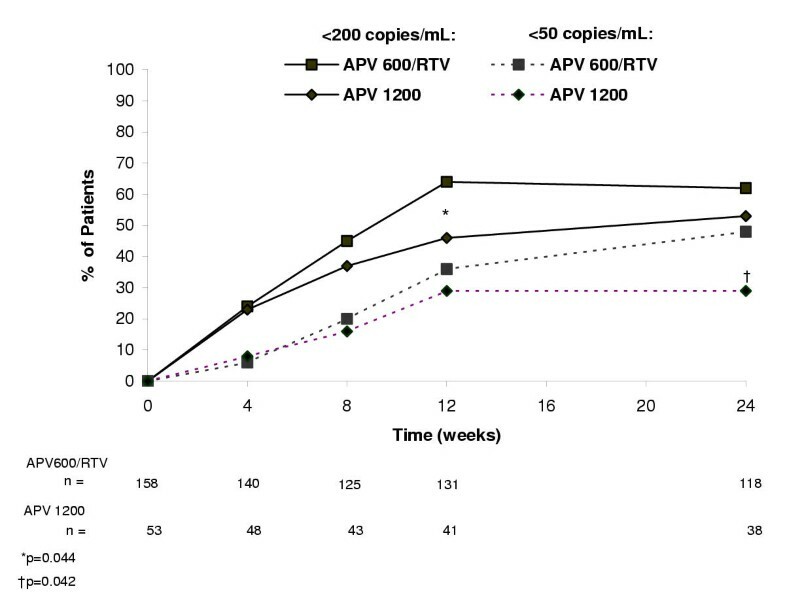 The virological results of this study indicate that over a 24-week treatment period the APV600/RTV regimen was statistically similar to or better than the APV1200 regimen according to the <200 copies/mL endpoint criterion. However, a significantly greater proportion of patients in the APV600/RTV treatment arm achieved HIV-1 RNA <50 copies/mL. Greater reductions in plasma HIV-1 RNA levels were also observed in patients receiving APV600/RTV BID than those using APV1200 BID. The greater magnitude of virologic suppression in the study population as a whole with the APV600/RTV regimen was expected in view of the results of earlier clinical pharmacokinetic studies showing a >6-fold higher Cmin level with APV600/RTV BID compared with the APV1200 BID regimen . Higher Cmin values achieved with RTV-boosting may be critical in treating antiretroviral-experienced patients, particularly those with HIV isolates having increased IC50 values. The proportion of antiretroviral-naïve patients who achieved HIV-1 RNA <200 copies/mL in the APV600/RTV arm was twice that for the APV1200 arm (63% vs 30%, P = 0.141). No differences in virologic efficacy between treatment arms were evident in the antiretroviral-experienced subgroup (42% vs 40%, P = 0.859). It is possible that proportionally more treatment-naïve patients may have responded to APV600/RTV due to poorer or more difficult adherence to the APV1200 regimen, but no adherence checks were included in this study to verify this. Although the <50 copies/mL endpoint criterion also showed a higher proportion of antiretroviral-naïve patients responding to APV600/RTV than to APV1200 (47% vs 20%), the differences were not statistically significant, possibly due to the small size of this subgroup. In another study of APV600/RTV in antiretroviral-naïve patients, Arasteh et al  reported a higher proportion of patients achieving plasma HIV-1 RNA <50 copies/mL (75%) than in the present study, perhaps due to the use of only lamivudine and abacavir as background antiretroviral medication and to differences in their study population relative to ours. The proportion of antiretroviral-experienced patients in the APV600/RTV treatment arm who achieved HIV-1 RNA <200 copies/mL at 24 weeks (58% [ITT:observed analysis]; 42% [ITT: M = F analysis]) was comparable to that reported in antiretroviral-experienced patients at 24 weeks in the studies by Schooley et al  (ESS40006 [PEARL]) (69% [ITT:observed analysis]), but much higher than that reported by Katlama et al  (31% [ITT: M = F analysis]). Differences in virologic suppression between the present study and the Katlama study may stem from the use of other background agents and the far greater antiretroviral experience and well-documented PI mutations in Katlama's patients. The 24-week extension phase showed that most patients who had HIV-1 RNA <200 copies/mL at week 24 maintained this level of virologic suppression through week 48. Thus, some indication of durability of viral suppression might be gathered from these data, although the number of patients evaluated in this study phase was small. The durability of virologic response to APV600/RTV was also suggested in an earlier study by Katlama et al . The increase in CD4+ cells observed at 24 weeks in the APV600/RTV BID arm was not different from that in the APV1200 arm. It was lower in magnitude than the CD4+ cell count increases reported for APV600/RTV arm at 24 weeks in antiretroviral-experienced patients in ESS40006 , and similar to that reported in heavily pre-treated patients by Katlama et al  in a patient population with comparable baseline disease characteristics (median HIV-1 RNA of 4.5 log10/mL and CD4+ count of 227 cells/mm3). The safety profile of the APV600/RTV regimen was similar to that of the APV1200 regimen with respect to the main adverse events, which were gastrointestinal (GI) in nature in both treatment arms. GI adverse events reported in the APV600/RTV arm were possibly due to the addition of RTV to the regimen, or because the reduction in pill burden and, hence, in excipients was not great enough to improve GI tolerance. The higher incidence of oral/perioral paresthesia in the APV1200 treatment arm was most likely due to the higher APV Cmax that occurs following APV1200 dosing compared with APV600/RTV BID dosing . Although the incidence of headache has been shown to increase with higher APV Cmax values , the incidence of this adverse event did not differ between treatment arms in this study. The higher incidence of hypertriglyceridemia in the APV600/RTV arm was probably due to RTV, because this PI has been reported to cause elevations in serum triglycerides . Other studies of RTV-boosted APV regimens have also reported that triglyceride elevation is usually grade 1 or 2 in magnitude, and, as in the present study, seldom necessitates treatment discontinuation or the addition of antihyperlipidemic drugs to the patient's treatment plan [10, 19]. This study evaluated a patient population that was ethnically diverse, with just over half of the patients being either African American or Hispanic. The inclusion of a large proportion of African American and Hispanic patients was deemed important because these are the populations in whom the HIV epidemic is increasing the most . Earlier clinical trials have tended to underrepresent these populations . One limitation of our study was that no pharmacokinetic analyses were performed to validate whether the RTV dosage regimen co-administered with APV600 was effectively boosting plasma APV exposure or Cmin levels. However, ESS40006, which also evaluated the APV600/RTV regimen over a 24-week period, did conduct a pharmacokinetic evaluation showing steady-state serum APV Cmin values of 2.49 μg/mL (i.e., over 8-fold higher than that usually achieved after the APV1200 regimen). Thus, plasma APV levels well above the IC50s of most HIV isolates were most likely achieved in ESS40011. Higher RTV doses of 200 mg BID and 400 mg BID co-administered with APV600 have resulted in no greater virologic suppression than 100 mg BID , and raising the dose of APV from 600 mg BID to 900 mg BID does not improve efficacy either, although it may increase the incidence of adverse events . In conclusion, APV600/RTV BID was similar to or better than APV1200 BID based on virologic results using the 200-copies/mL HIV-1 RNA endpoint. Of note, a significantly greater proportion of patients in the APV600/RTV treatment arm achieved HIV-1 RNA <50 copies/mL at week 24, which was a secondary endpoint. Other beneficial features of the APV600/RTV regimen, such as improved dosing convenience and reduced pill burden, need to be factored into decision making when APV600/RTV is being considered by clinicians as a therapeutic option for the treatment of either antiretroviral-naïve or -experienced patients with HIV infection. The authors gratefully acknowledge the study participants, clinical investigators and staff, Ingenix staff, PPD staff, Tibotec-Virco, and the GlaxoSmithKline (GSK) study team: Marianna McDonald, Terri Becom, Ashwin Hirani, Brian Wine, Claressa Jolly, and Carol Humphries. We also wish to thank Gary E. Pakes, Pharm.D. for his assistance in the writing of this manuscript.